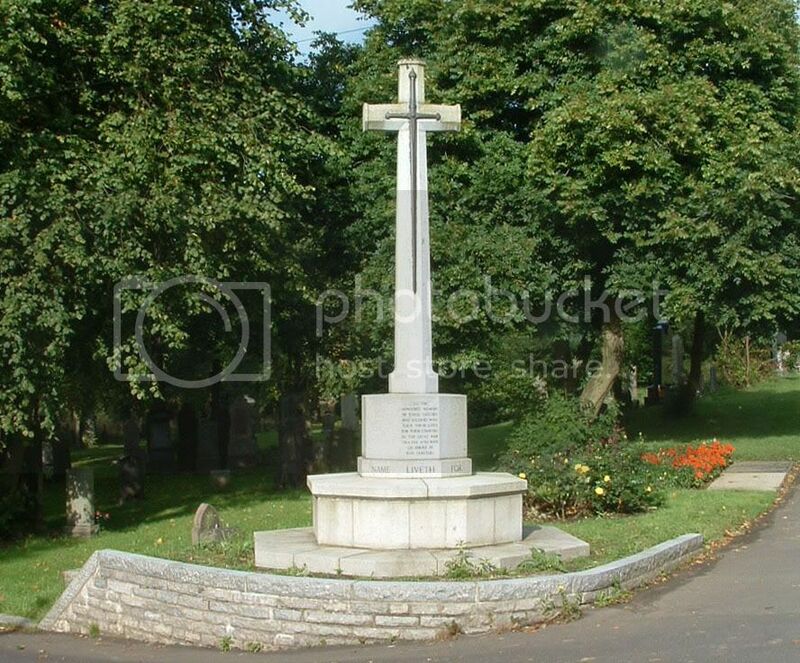 There has been a new memorial erected in Riddrie Park commemorating the men buried in Section A which is not accesible. See pages 39 and 40 of this thread. 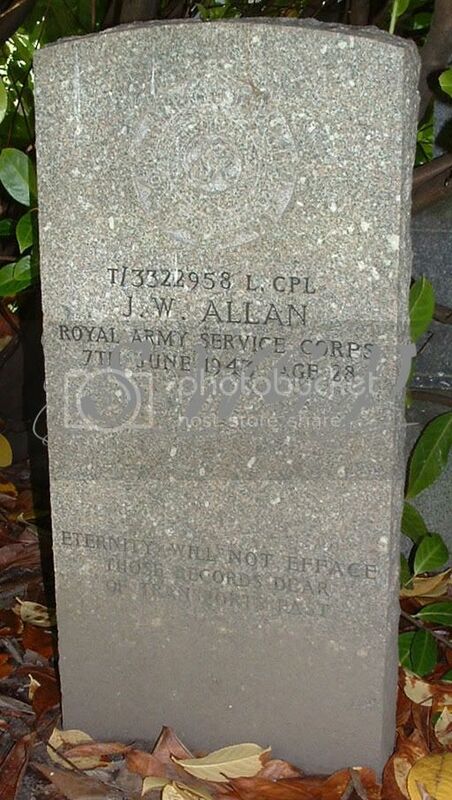 CWGC Website states: "Due to subsidence, a small area of section A is closed to the public. 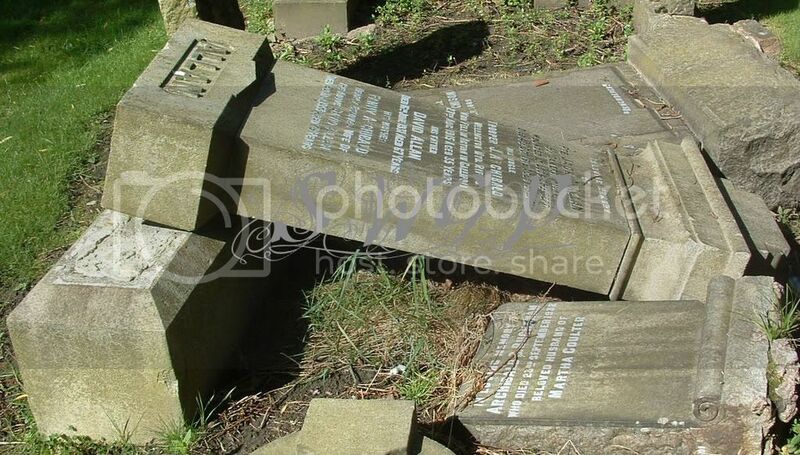 Glasgow City Council advise that you contact them prior to visiting as they can check to see if a particular grave if situated in the affected area." It seems that the cemetery is on top of disused mine workings and although CWGC states that only a small part of Section A is closed, this 'small part' actually covers quite a sizeable area. The following photograph shows just a small section of the 'small part' and from that, the conditions are quite apparent! 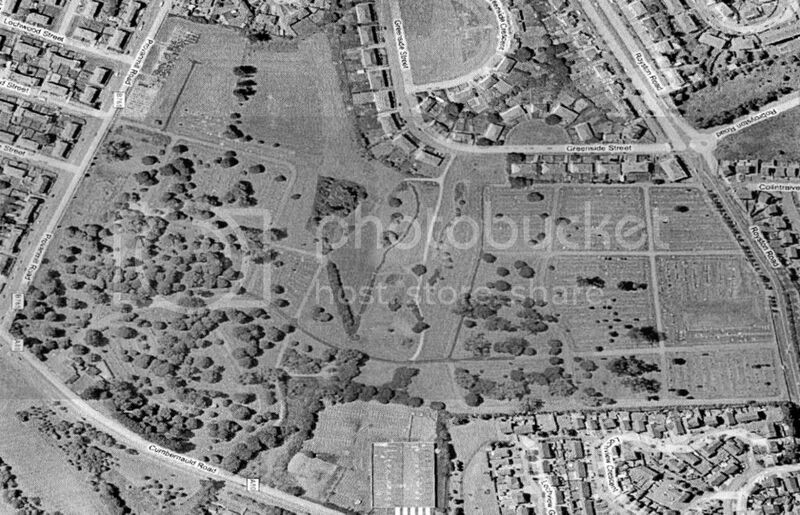 The cemetery is in two 'halves', the oldest part (Sections A - E) are at the Provanmill Road side and include a small Jewish Section, whilst the remainder are at the Royston Road side. The following are the CWGC listed graves in Section A which I have been unable to find. Additional information:	Son of Archibald and Bessie Wilson Adam; husband of Mary Thompson Adam, of 462, Keppochill Rd., Glasgow. 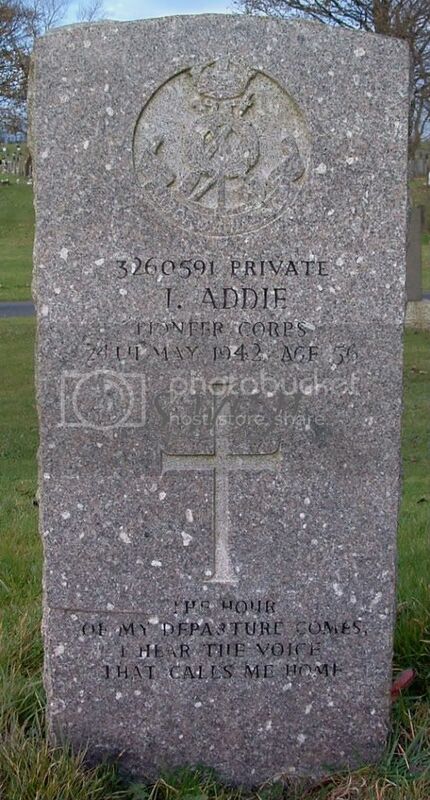 Additional information:	Son of Gavin and Helen Addie; husband of Jeanie Addie, of Glasgow. Grave/Memorial Reference:	Sec. G. Grave 2665. 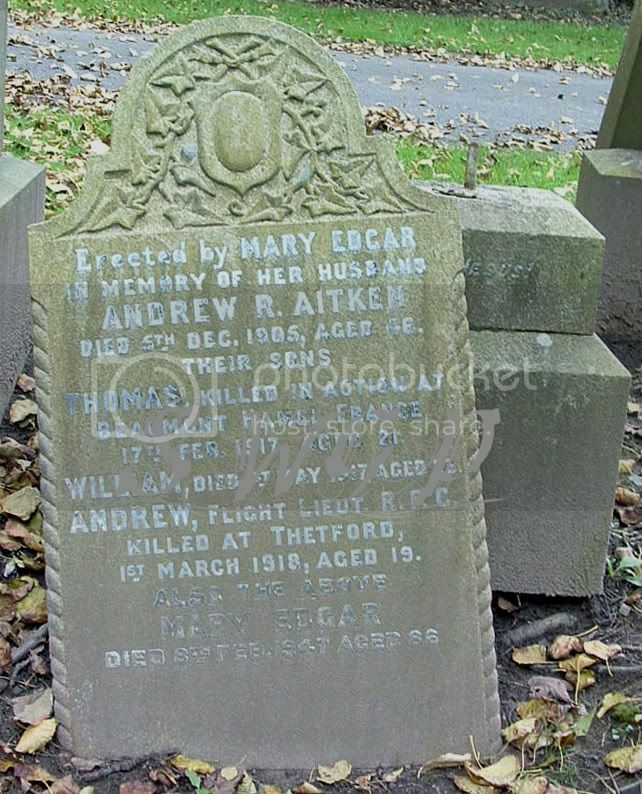 Additional information:	Son of Andrew Ramsay Aitken and Mary Aitken (nee Edgar) of 84, Cardross St., Dennistoun, Glasgow. Additional information:	Son of Mary Aitken (nee Edgar), of 84, Cardross St., Dennistoun, Glasgow, and the late Andrew Ramsay Aitken. 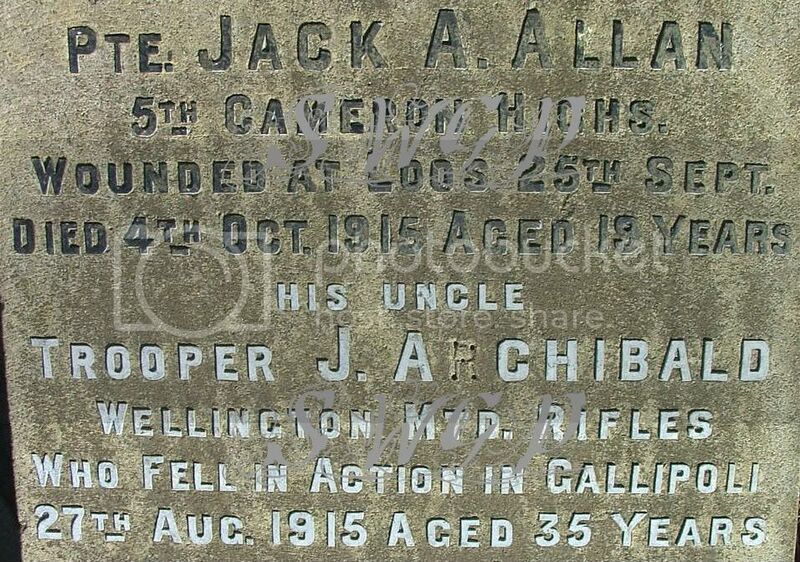 Both brothers should have their father listed as deceased as he died in 1905. 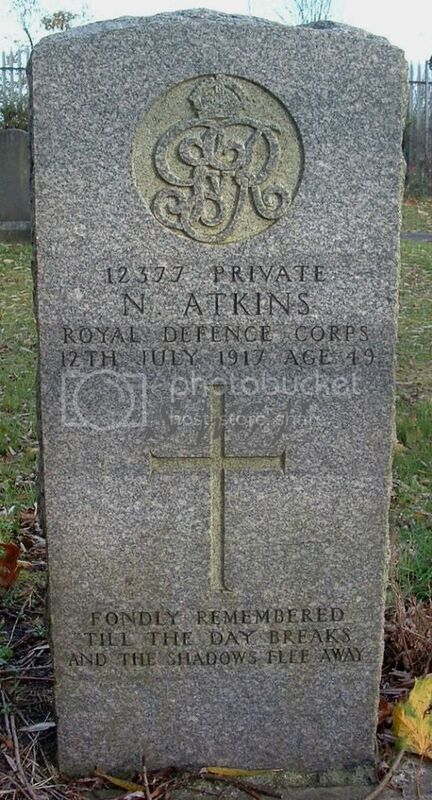 Additional information:	Husband of A. Aitken, of 65, Appin Rd., Dennistoun, Glasgow. This stone is in the part of Section A which is unaccessible. Photo taken at maximum zoom. Grave/Memorial Reference:	Sec. B. Grave 373. 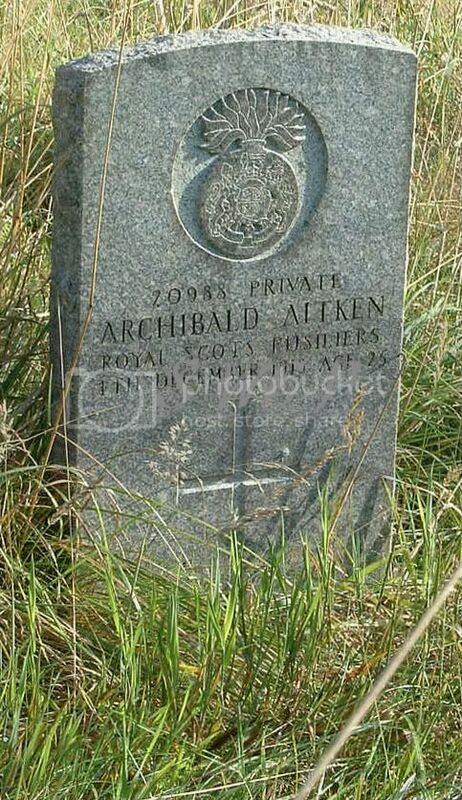 Additional information:	Son of Frederick and Polly Allan, of Glasgow; husband of Janet Allan, of Glasgow. Grave/Memorial Reference:	Sec. A. 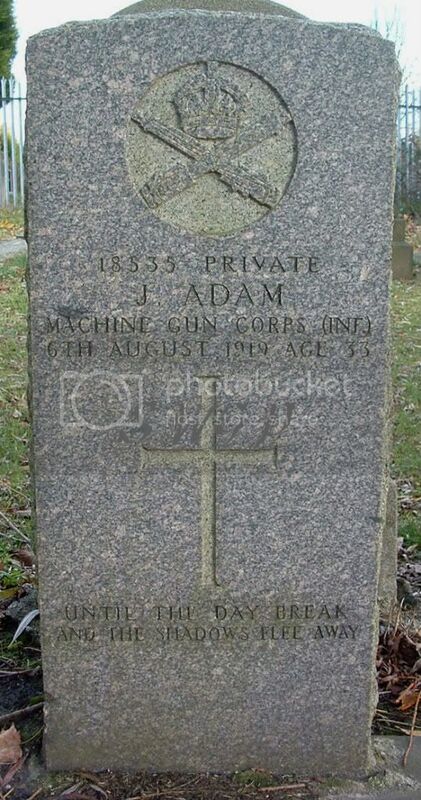 Grave 2573. 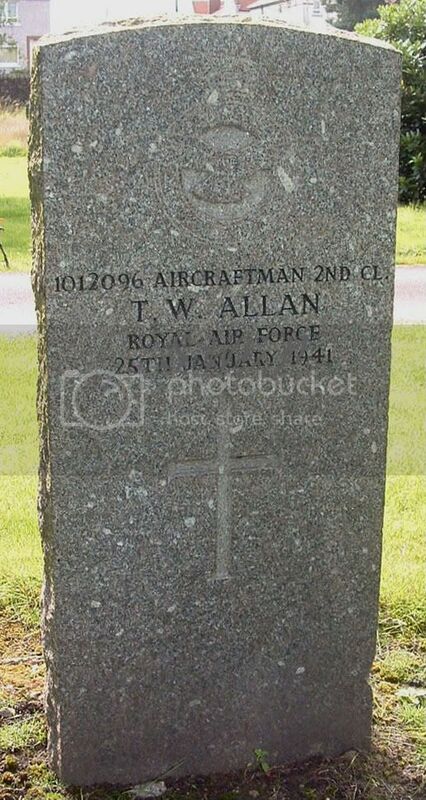 Additional information:	Son of David and Fanny Allan (nee Archibald), of 22, Craigpark Drive, Dennistoun, Glasgow. Regiment/Service:	Wellington Mounted Rifles, N.Z.E.F. Unit Text: 52 Div. Sigs. 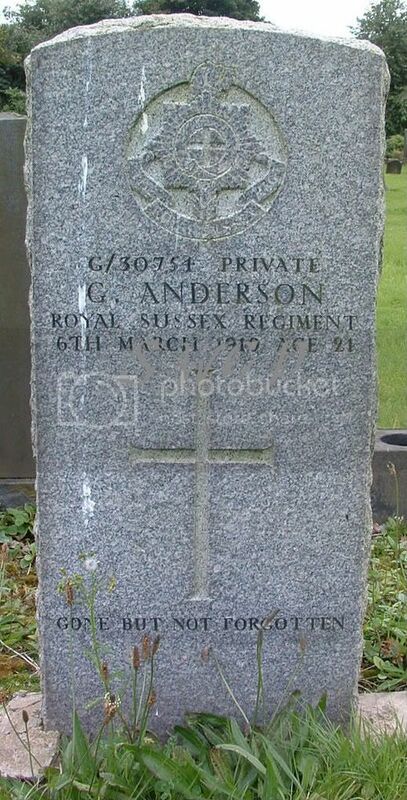 Additional information: Son of George and Margaret Allison, of Glasgow; husband of Isabella Rue Allison, of Glasgow. Grave/Memorial Reference: Sec. A. Grave 715. 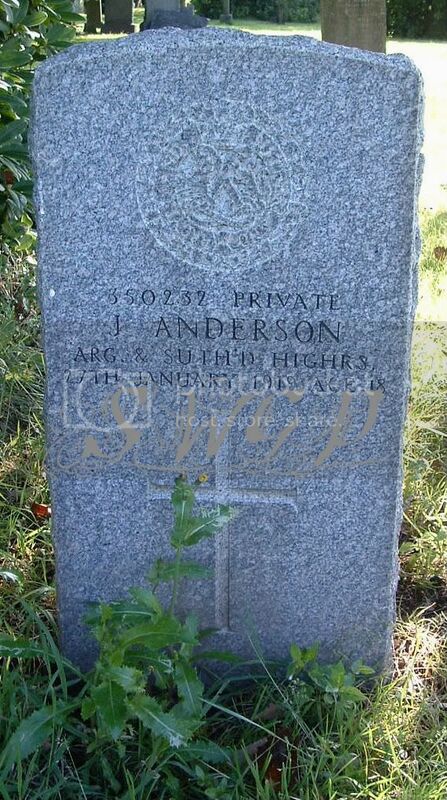 Additional information:	Husband of Elizabeth Anderson, of 03, Wishart St., Dennistoun, Glasgow. 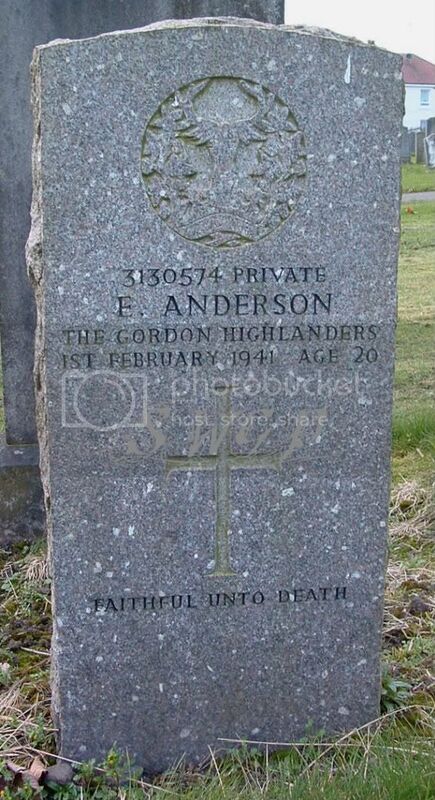 Additional information:	Son of Ebenezer and Matilda Anderson, of Glasgow. Grave/Memorial Reference:	Sec. G. Grave 4862. 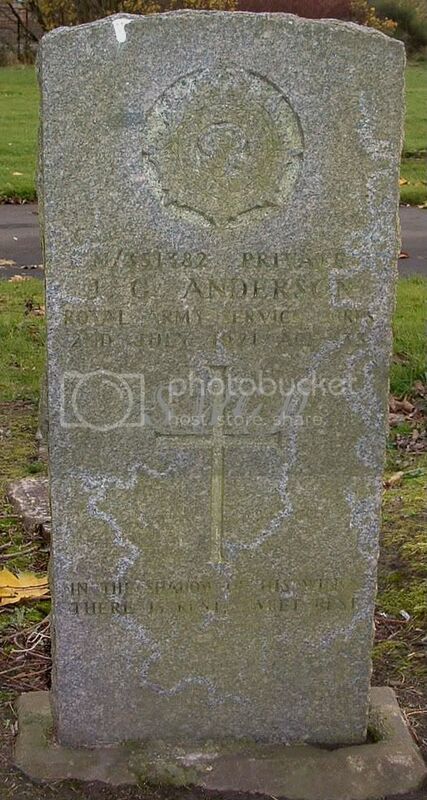 Additional information:	Son of Mrs. Anderson, of 457, Gallowgate, Glasgow. Grave/Memorial Reference:	Sec. A. Grave 9359. 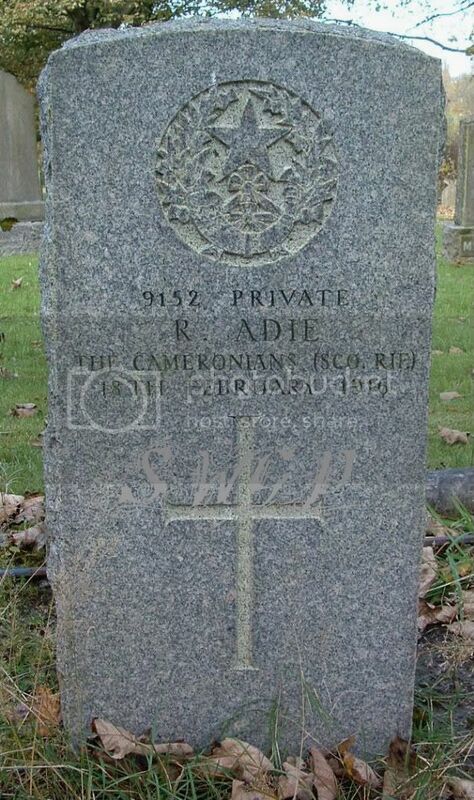 Additional information:	Husband of Jane Gray Atkins, of 556, Calder St., Polmadie, Glasgow.